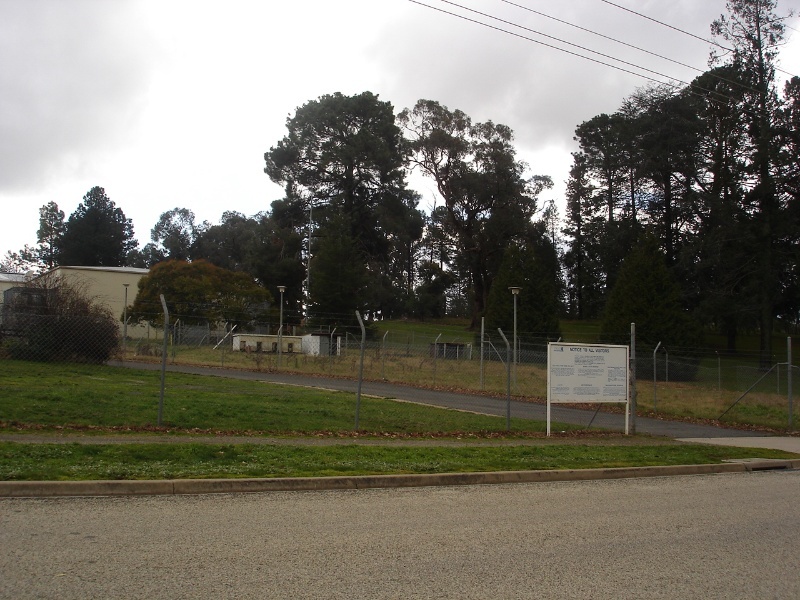 Queen Victoria Park Beechworth is situated between the Beechworth-Wangaratta Road (formerly Sydney Road) and High Street and is bounded to the north-east by the Beechworth Primary School and the Beechworth Gaol to the south-west. In 1858 eighteen acres to the north-east of the town was secured as a 'public garden and promenade' reserve. 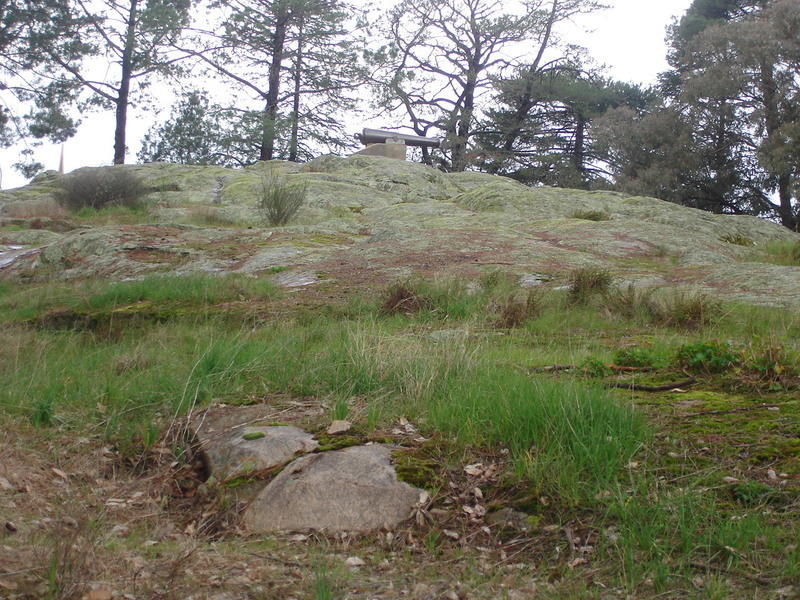 The central feature of the site was an outcrop of granite surrounded by remnant indigenous vegetation. A Public Botanical Garden Committee was formed to oversee the Reserve and in 1859 the Committee held a design competition and selected an elaborate design by J A Rochlitz, a daguerreotype artist from Hungary. The Reserve was fenced and prison labour used to clear the site. By 1861 the first exotic trees were planted and poplars donated by James Shackell were planted along Sydney Road and High Street. In 1863 Dr Mueller of the Melbourne Botanic Gardens sent seeds and shrubs and recommended that the Council establish a nursery to raise its own plants. 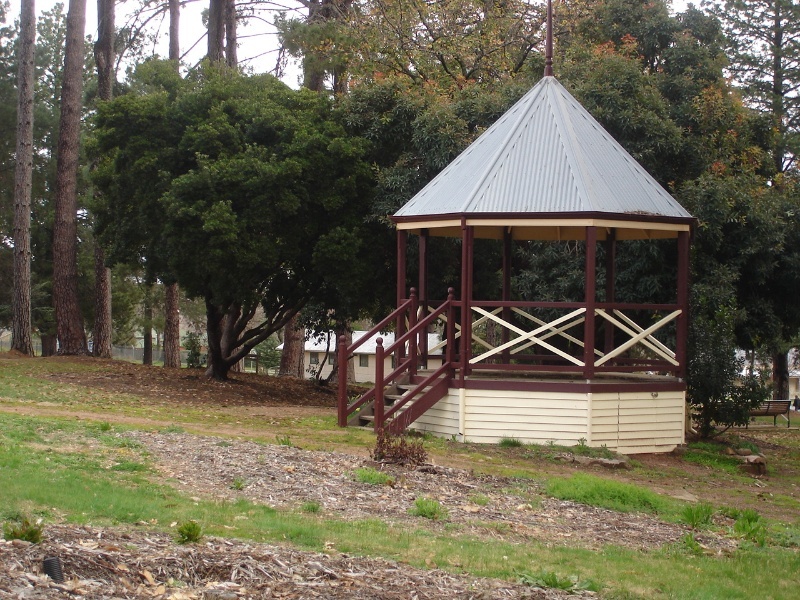 The first structure built in the gardens in 1866 was a lodge, (later removed), designed by the Borough surveyor located between the carriage entrance and the corner of Kars Street and Sydney Road and was rented out in return for one day's work a week. By 1868 False Acacias (Robinia pseudoacacia) were planted in Sydney Road and work including cutting drains, clearing scrub and improving footpaths was carried out. In 1870 another grant was received for fencing public parks and 180 plants were received from the Melbourne Botanic Gardens. By 1873 the Gardens had become overgrown and weedy. In 1874 four acres of the Botanical reserve was excised for a state school. In 1875 the Market Reserve at the corner of Ford, William and Loch streets was converted into the Town Hall Gardens thereby competing with the Botanical Reserve for popularity and Council funding. A further three acres was excised from the Gardens and added to the school grounds in 1876. By 1879 the Tree Planting Committee reported that the Botanical Gardens were in splendid condition and 140 trees were ordered from Melbourne to replace losses and by 1884 walks had been made and seats provided. In 1900 plans for Federation celebrations for 1 January 1901 were underway with the Beechworth Town Band applying to use the reserve for recitals and two naval guns from the HMVS Nelson were mounted on the large central rocky outcrop. In 1901 new plans to improve the Park were prepared by Harper and Stewart showing walks, a carriage drive around the rock, sites for a bandstand, fernery, wooden gates, a rockery and approximately 200 trees. Fourteen pines were planted in the main avenue to represent the twelve councillors in office and the Shire Engineer and Shire Secretary. 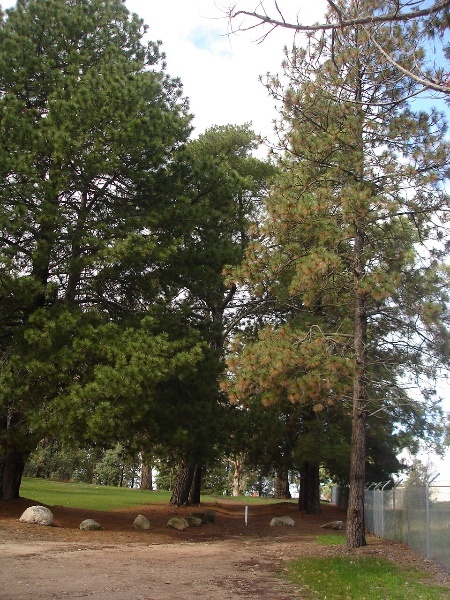 The avenue now contains twenty-six trees consisting of Maritime Pines (Pinus pinaster) along the north side and Canary Island Pines (Pinus canariensis) opposite and two Sierra Redwoods (Sequoiadendron giganteum) at the entrance although which trees are the commemorative trees is not known. The remnant trees and exotic plantings from the late nineteenth century to 1902 remains one of the main features of the Park with many of botanical importance including some of the rarest and largest conifers in Victoria. There is also an extant avenue of English Oaks (Quercus robur) along the High Street boundary. On 7 May 1902 the reserve was named Queen Victoria Park after the monarch's death and a commemorative marble tablet fixed to the rock. Additional trees were planted out in the park and the school and gaol sites were fenced off to help protect the site from the continual problem of wandering stock and vandalism. In 1903 the bowling club was established but relocated in 1921, with the facilities taken over by the Ladies Croquet Club until the 1930s. In c1903 a band rotunda was constructed and the current rotunda (1988) now located in the same position. The two cast iron light fixtures have been relocated to the driveway entrance to make a pair. In c1910 the concert pavilion and open air picture screen (brick base extant) were constructed north-west of the rock. and by 1913 open air concerts, band recitals and picture shows became regular events in the Park. By 1952 a stone shelter shed and toilet block had been erected near High Street and the Council sought permission to charge fees for the use of a portion of the reserve for camping but by 1959 this activity had been moved to Lake Sambell. 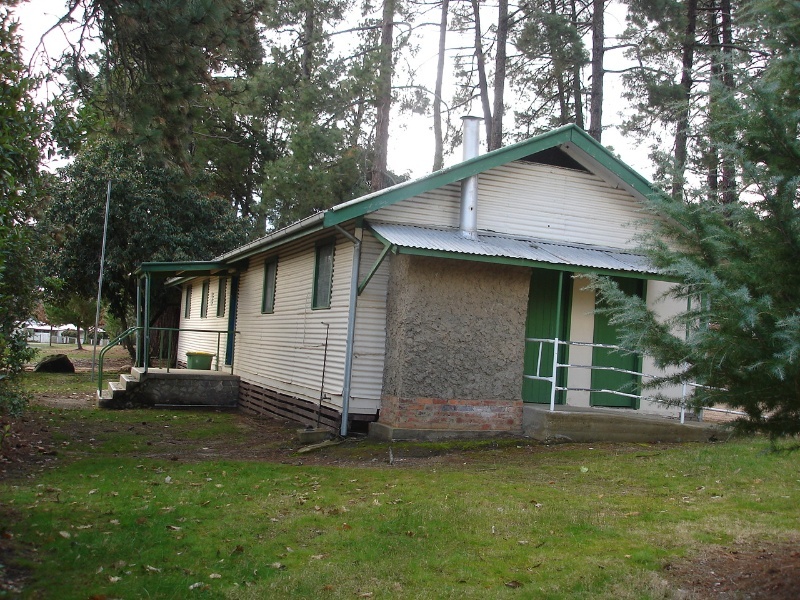 In 1964 an ex-army hut was erected for the Girl Guides in the south-western corner which is extant. 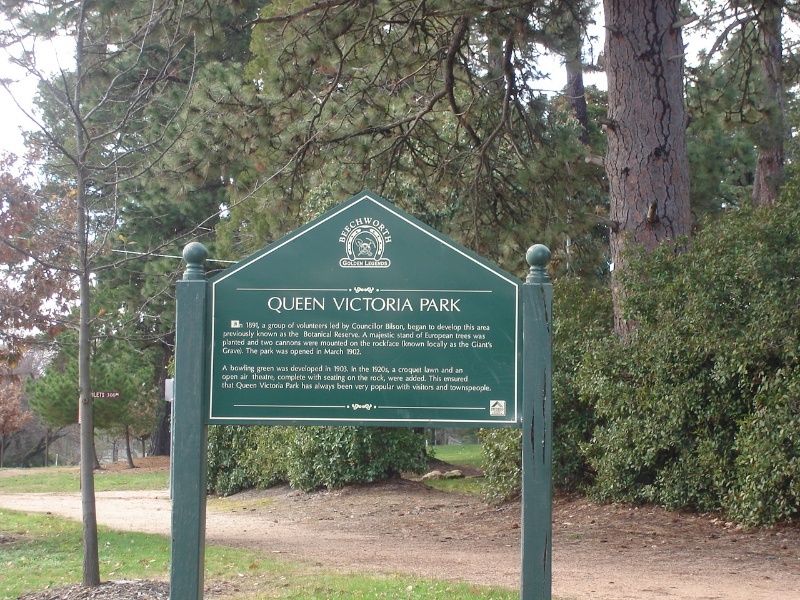 In 1984-5 Queen Victoria Park participated in the 150th Anniversary of Victoria receiving money for tree works and cleaning up with additional trees received from the Royal Botanic Gardens in 1996. Considerable restoration works occurred in 2001 to reconstruct original pathways, gardens and historic features of the Park and a new playground. The site is on the land of the traditional owners. Queen Victoria Park Beechworth is of historical, aesthetic, and scientific (botanical) significance to the state of Victoria. Queen Victoria Park Beechworth is of historical significance as an important example of a regional botanical garden, established in the nineteenth century in response to the increased wealth of Victoria with the discovery of gold and the desire to provide a place for recreation and education in keeping with European trends. Queen Victoria Park Beechworth is of historical significance for its early reservation in 1858 as a botanical garden reserve organised by the Beechworth Town Council and the Central Board of Health. In the 1860s and early 1870s the Park had an early association of the Park with Dr Mueller, Director of the Melbourne Botanic Gardens and one of Australia's most prominent botanists, who provided many of the original plants. The two guns mounted on the central rock feature as part of the Federation celebrations in 1901 and the marble tablet commemorating the naming of the Park in memory of Queen Victoria in 1902 are also of historical significance. 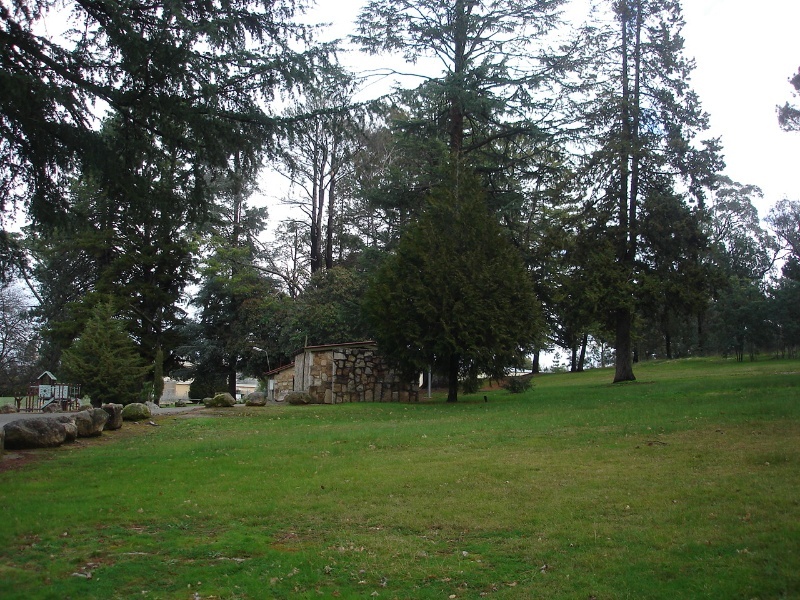 The Queen Victoria Park , Beechworth is of historical significance for the c1913 outdoor picture theatre, which is possibly the earliest such installation in Victoria. The Park contains the only known surviving remnant (the base of the screen) of this feature. Queen Victoria Park Beechworth is of aesthetic significance as an open park featuring many closely planted pines which create a forest-like impression of a tall coniferous forest. A major visual feature of the Park is the large central granite outcrop which is the highest point in the Park which provides some view through the trees over Lake Sambell to the south-east and the township of Beechworth to the north-west. 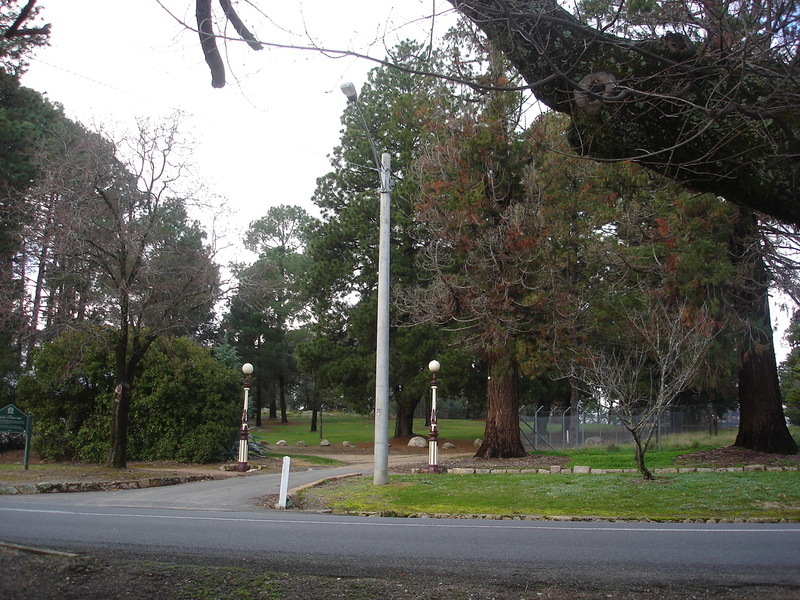 Formal intact landscape elements include the commemorative avenue of pines along the drive of main drive off the Beechworth-Wangaratta Road and an avenue of English oaks parallel to High Street. Queen Victoria Park Beechworth is of scientific (botanical) significance for its outstanding collection of unusual and rare mature conifers. This includes three [1 tree removed 2010]specimens of Loblolly Pine (Pinus taeda), the only known examples in Victoria and the largest known specimen of the Big Cone Pine (Pinus coulteri). Other uncommon and significant trees are a Himalayan White Pine (Pinus wallichiana), a Bentham Cypress (Cupressus lusitancia var benthami), Cupressus torulosa var corneyana, two Incense cedars (Calocedrus decurrens) as well as two Sierra Redwoods (Sequoiadendron giganteum). 1. All the buildings marked as follows on Diagram 2262 held by the Executive Director. 2. All the features marked as follows on Diagram 2262 held by the Executive Director. 3. All the paths marked as P1 on Diagram 2262 held by the Executive Director. 4. 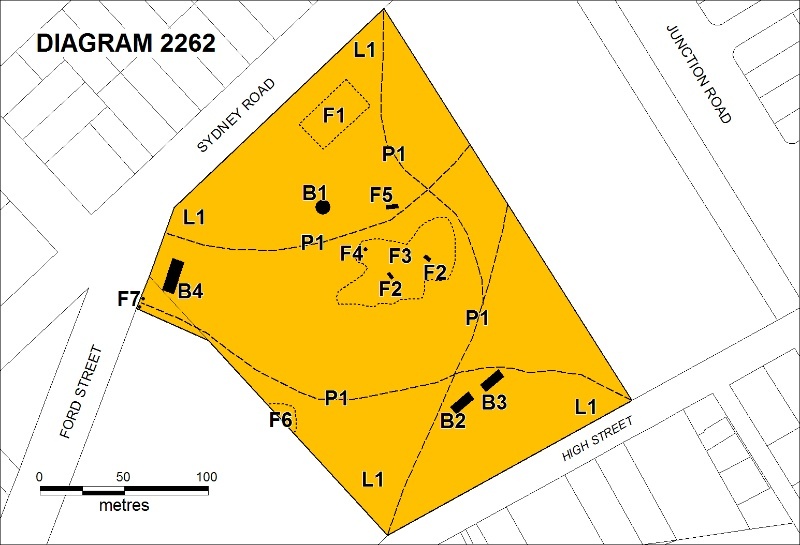 All of the land marked L1 on Diagram 2262 held by the Executive Director being all of Crown Allotment 4, Section 23, Township of Beechworth and part of the road reserve of Ford Street. Most of the regional botanic gardens developed as landscaped gardens, although there was a sharp contrast between these sites and the various municipal parks and gardens where an emphasis on floral displays and ornamentation tended to dominate, especially in the twentieth century. 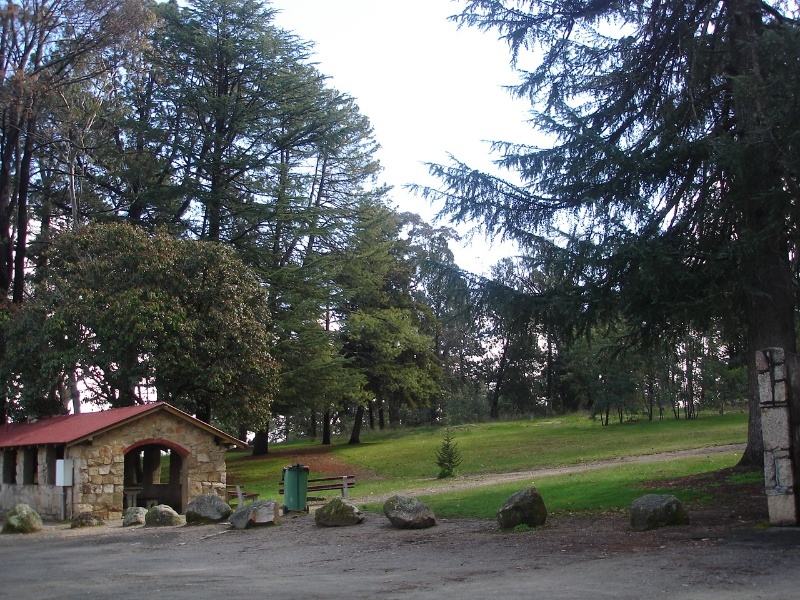 Queen Victoria Park Beechworth is situated between the Beechworth-Wangaratta Road and High Street and is bounded on its north-east by the Beechworth Primary School and on its southwest by the Beechworth Gaol. In 1858 eighteen acres to the north-east of the town was secured as a public garden reserve. The central feature of the site was an outcrop of granite surrounded by remnant indigenous trees. A Public Botanical garden committee was formed to oversee the reserve and a contract was let for fencing, a gate and turnstile. In 1859 the Committee held a design competition and selected an elaborate design by J A Rochlitz, a daguerreotype artist from Hungary. The reserve was fenced and prison labour used to clear the site. The new gaol on the south-western side was constructed between 1859-64. By 1861 the first trees had been planted along a pathway and another was being constructed. In 1863 Dr Mueller of the Melbourne Royal Botanic Gardens sent seeds and shrubs ad recommended that the council establish a nursery to raise its own plants. The first structure built in the gardens in 1866 was a lodge designed by the Borough surveyor constructed one chain back from the fence, midway between the carriage entrance and the corner of Kars Street and Sydney Road. (Later removed). By 1868 a well, earth closet and fence had been added and a tender was called for a person to occupy the lodge in return for providing one day's work a week. Acacias (most likely Robinia pseudoacacia) were planted in Sydney Road and work including cutting drains, clearing scrub and improving footpaths was carried out. In 1870 another grant was received for fencing public parks and 180 plants were received form the Melbourne Botanic gardens. By 1873 the Gardens had become over- grown and weedy. In 1874 four acres of the Botanical reserve was excised for a state school. In 1875 the Market reserve at the corner of Ford, William and Loch streets was converted into the Town hall gardens thereby competing with the Botanical Reserve for popularity and Council maintenance. A further three acres was excised and added to the school grounds in 1876. By 1879 the Tree Planting Committee reported that the Botanical Gardens were in splendid condition and 140 trees were ordered from Melbourne to replace losses. And by 1884 walks had been made and seats provided and the reserve fenced with a brick lodge. In 1900 plans for Federation celebrations for 1 January 1901were underway with the Beechworth Town Band applying to use the reserve for recital and two naval guns from the HMVS Nelson were mounted on the rocky outcrop. This led to redevelopment proposals. In 1901, following Federation celebrations, Councillor Billson promoted the development of the Park and a plan was drawn up by Harper and Stewart showing walks , a carriage drive around the rock, sites for a bandstand, fernery, wooden gates, a rockery and approximately 200 trees. Volunteer labour cleared, formed beds and planted trees and shrubs including 20 trees in the "avenue" and 18 grevilleas around "the oval." In 1902 the reserve was named Queen Victoria Park in memory of the late monarch and a marble tablet fixed to the rock. Additional trees were planted out in the park and the school and gaol sites to help protect the site from the continual problem of wanderings stock and vandalism. In 1903 the bowling club was established but relocated in 1921, the green then being used by the Ladies Croquet Club until the 1930s. The band rotunda was constructed around this time. Additionally c1910 the concert pavilion was constructed north-west of he Rock and by 1913 open air concerts, band recitals and picture shows became regular events. By 1979 a playground had been constructed on the northern side of the gardens. In 1984-5 Queen Victoria Park participated in the 150th Anniversary of Victoria receiving money for tree works and cleaning up the Park with additional trees from the Royal Botanic Gardens 1996 'Flora for Victoria' planted.. Between 1986 and 1998 three studies were undertaken of the Park all of which informed the Queen Victoria Park Beechworth - Conservation Study and Master Plan, October 2000. Reserved in 1858 as a botanical reserve, the Park received many plants from Baron von Mueller, Director of the Royal Botanic Gardens, Melbourne and has an outstanding collection of unusual and rare mature conifers. 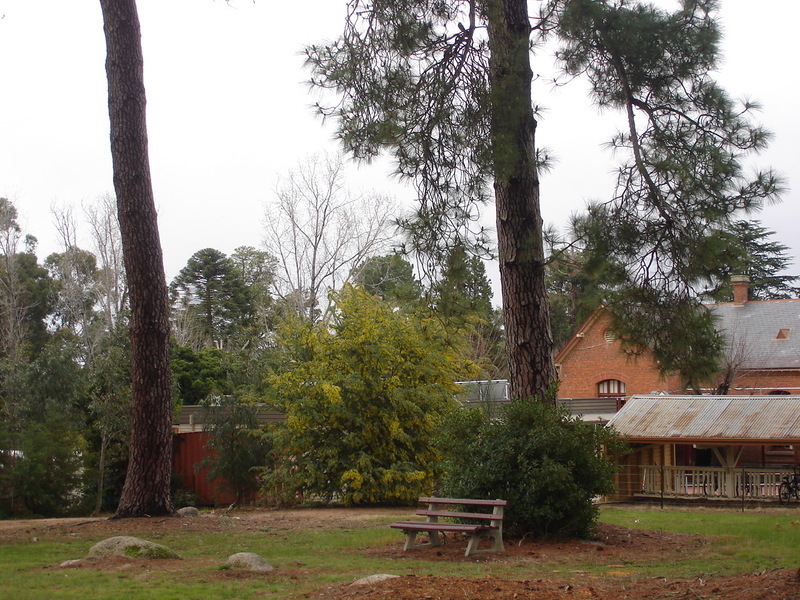 Quuen Victoria Park, Beechworth is an important example of a regional botanical garden, established in the nineteenth centuryin response to the increased wealth of Victoria with the discovery of gold and the desire to provide a place for recreation and education in keeping with European trends. Queen Victoria Park Beechworth is of scientific (botanical) significance for its outstanding collection of rare mature conifers. This includes three specimens of Loblolly Pine (Pinus taeda), the only known examples in Victoria and the largest known specimen of the Big Cone Pine (Pinus coulteri). Other uncommon and significant trees are a Himalayan White Pine (Pinus wallichiana), a Bentham Cypress (Cupressus lusitancia var benthami), Cupressus torulosa var corneyana, two Incense cedars (Calocedrus decurrens) as well as two Sierra Redwoods (Sequoiadendron giganteum). Queen Victoria Park Beechworth is of aesthetic significance as an open park featuring many closely planted pines which create a forest-like impression of a tall coniferous forest. A major visual feature of the Park is the large central granite outcrop which is the highest point in the Park which provides some view through the trees over Lake Sambell to the south-east and the township of Beechworth to the north-west. Formal intact landscape elements of aesthetic significance include the commemorative avenue of pines along the drive of main drive off the Beechworth-Wangaratta Road and an avenue of English oaks parallel to High Street. The Queen Victoria Park is of historical significance for its early association with Dr Mueller, Director of the Melbourne Botanic Gardens and one of Australia's most prominent botanists, who provided many of the original plants. 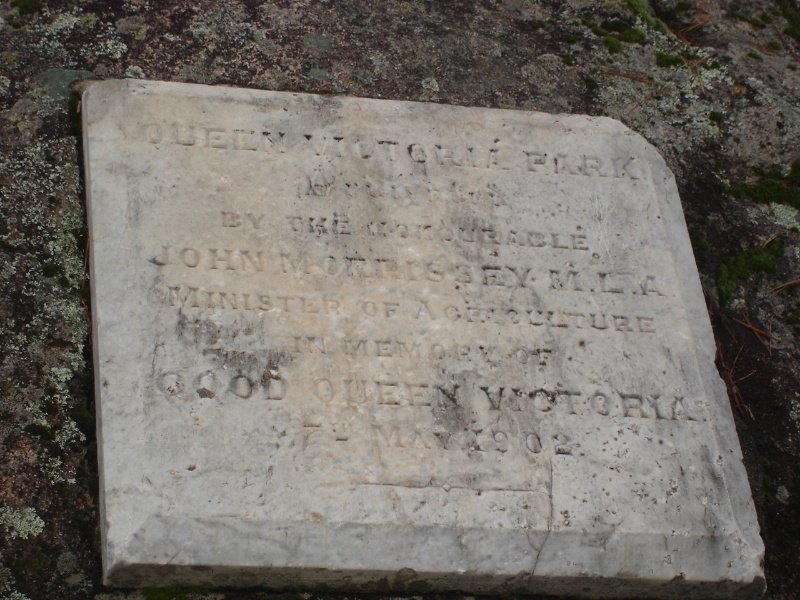 The marble tablet commemorating the naming of the Park in memory of Queen Victoria in 1902 is also of historical significance. General Conditions: 1. All exempted alterations are to be planned and carried out in a manner which prevents damage to the fabric of the registered place or object. General Conditions: 2. Should it become apparent during further inspection or the carrying out of works that original or previously hidden or inaccessible details of the place or object are revealed which relate to the significance of the place or object, then the exemption covering such works shall cease and Heritage Victoria shall be notified as soon as possible. Note: All archaeological places have the potential to contain significant sub-surface artefacts and other remains. In most cases it will be necessary to obtain approval from the Executive Director, Heritage Victoria before the undertaking any works that have a significant sub-surface component. General Conditions: 3. If there is a conservation policy and plan endorsed by the Executive Director, all works shall be in accordance with it. Note: The existence of a Conservation Management Plan or a Heritage Action Plan endorsed by the Executive Director, Heritage Victoria provides guidance for the management of the heritage values associated with the site. It may not be necessary to obtain a heritage permit for certain works specified in the management plan. General Conditions: 4. Nothing in this determination prevents the Executive Director from amending or rescinding all or any of the permit exemptions. General Conditions: 5. Nothing in this determination exempts owners or their agents from the responsibility to seek relevant planning or building permits from the responsible authorities where applicable. Minor Works : Note: Any Minor Works that in the opinion of the Executive Director will not adversely affect the heritage significance of the place may be exempt from the permit requirements of the Heritage Act. A person proposing to undertake minor works must submit a proposal to the Executive Director. If the Executive Director is satisfied that the proposed works will not adversely affect the heritage values of the site, the applicant may be exempted from the requirement to obtain a heritage permit. If an applicant is uncertain whether a heritage permit is required, it is recommended that the permits co-ordinator be contacted. The process of gardening, mowing, hedge clipping, bedding displays, removal of dead plants and weed control, emergency and safety work and landscaping in accordance with the original concept. The planting of plant species to conserve the landscape character, rare and unusual species, exotic and native plants, planted in beds, shrubberies and as specimen trees in lawns. Management and maintenance of trees including formative and remedial pruning, removal of deadwood, pest and disease control, cabling, mowing, weed control and mulching. In the event of loss or removal of trees, replanting with the same species to maintain the landscape character identified in the statement of significance. Removal of tree seedlings and suckers but excluding herbicide use. Management of trees in accordance with Australian Standard: Pruning of amenity trees AS 4373. Management of trees in accordance with Australian Standard: Protection of trees on development sites AS 4970. Removal of plants listed as Prohibited and Controlled Weeds in the Catchment and Land Protection Act 1994. Repairs, conservation and maintenance to structures and hard landscape elements, memorial plaques, asphalt and gravel roads and paths, stone and concrete edging, fences and gates. Installation, removal or replacement of garden watering and drainage systems beyond the canopy edge of mature trees. Queen Victoria Park Conservation Study and Master Plan, Prepared for Shire of Indigo by John Patrick Pty Ltd October 2000 should continue to be consulted before any proposed works are undertaken. The plan sought to re-establish the original gardens concept including the maintenance of existing trees stands and replace and reinstate original pathways and facilities. Consideration should also be given to updating this study in the future to inform the further conservation and management of the Gardens.